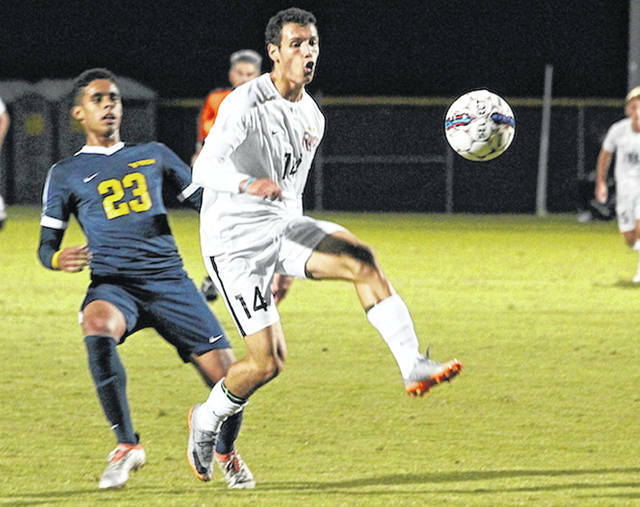 Rio Grande’s Nicolas Cam Orellana scored the first of the RedStorm’s three goals in Thursday night’s 3-1 win over West Virginia University-Tech at Evan E. Davis Field. RIO GRANDE, Ohio — A quick start, solid defense and a strong finish proved to be the ingredients that the University of Rio Grande needed to continue its winning ways. The RedStorm scored 3-1/2 minutes into the match and then added two insurance markers over the final 6-1/2 minutes for a 3-0 win over West Virginia University-Tech, Thursday night, in River States Conference men’s soccer action at Evan E. Davis Field. Rio Grande, ranked No. 5 in the latest NAIA coaches’ poll, improved to 12-0 overall and 6-0 in the RSC. The RedStorm also avenged a shootout loss to the Golden Bears in the semifinal round of last year’s RSC Tournament in the process. Tech, which received enough votes for the equivalent of 27th place in the same poll, dropped to 10-1-4 overall and 4-1-1 in league play with the loss. The Golden Bears were bottled up offensively from the outset, managing just four shots overall and one shot on goal in the contest. Rio Grande managed just 12 shots of its own – less than half of its national-leading per game average of 25. The first of the RedStorm’s three goals came off a corner kick opportunity by senior Harry Reilly (Coventry, England), a WVU-Tech transfer and the reigning RSC Offensive Player of the Week. Freshman Nicolas Cam Orellana (Santiago, Chile) headed in Reilly’s corner just 3:31 into the contest. That’s how things stayed until freshman Manyumow Achol (Wellington, New Zealand) scored off a centering pass into the 18-yard box by senior Eduardo Zurita (Sant Boi de Llobregat, Spain) with 6:18 left in the game. Sophomore Callum Malanaphy (Stourbridge, England) closed out the scoring just 3:36 later with a nifty header off a crossing pass from the far left wing by Reilly. Junior goalie Richard Dearle (Castle Donington, England) recorded one save in the shutout victory – Rio’s 11th in 12 outings. Jose Domingo Xam-mar had two saves in the loss for the Golden Bears. Rio Grande returns to action on Saturday night when it hosts Shawnee State University in non-conference action. The annual “Rockets over Rio” fireworks celebration, held in conjunction with the Bob Evans Farm Festival, will follow the conclusion of Saturday’s match at approximately 9:30 p.m.